In these last nine weeks, we have talked 9 attributes of a mature Christian. Today we come to #10. I think they leave it to last because it might be the hardest for many of us: GENTLENESS. Why would I say gentleness is hard? We are all nice people… but we live in a culture that is anything but gentle. It seems that our culture is becoming angrier, louder, and more critical every day. • I should not have to be inconvenienced by others. • My opinions and views are more valid than anyone else’s. Maybe that seems farfetched to folks who are “IOWA NICE” but if you spend a little time in a crowd or a traffic jam and you’ll see that even “Iowa Nice” is getting crankier. After spending 3-1/2 hours enduring long lines, rude clerks and insane regulations at the Department of Motor Vehicles, Glenn stopped at a toy store to pick up a gift for his son. He brought his selection - a baseball bat - to the cash register. “Cash or charge?" the clerk asked. "Cash," He snapped. Then apologizing for his rudeness, he explained, "I’ve spent the entire afternoon at the motor vehicle bureau." The woman sweetly replied, "Oh, then shall I gift-wrap the bat…or are you going back there?" In a Gallup survey of the favorite topics in the Believe series, Gentleness came in dead last. The question that tripped people up was, “Are you known as someone who raises their voice?” How about you? Be honest with yourself. Better yet, ask a friend or family member who will be honest with you. The question is, are you more the like the crocodile or the butterfly. I thought it was interesting that the topic of Gentleness falls on Christ the King Sunday. Stereotypically, we think of kings as a powerful, figures who command armies, order executions, rule with absolute authority, and gets exactly what they want. Kind of like an alligator. In contrast to that image, Jesus, the king of creation and lord of our lives was gentle. He described himself as “gentle and humble in heart,” and Matthew describes him as “humble and riding on a donkey.” He played with children, had compassion on the sick, and lovingly built relationships with all kinds of people. Don’t misunderstand me… Jesus got impatient with the hard-headedness of the disciples and the crowds. He turned over the tables in the temple. He called Peter “Satan” and ordered him to get behind him. Yet Jesus said, “Take my yoke upon you and learn from me, for I am gentle and humble in heart, and you will find rest for your souls. For my yoke is easy and my burden is light." 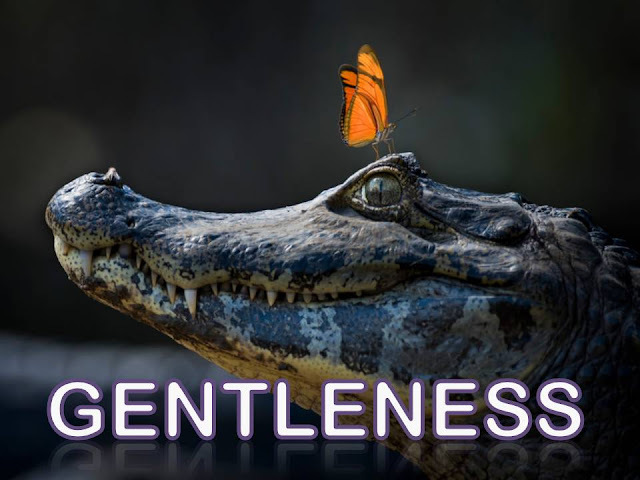 Jesus said, “I am gentle”… what does gentle mean? “Gentleness” usually means being merciful, understanding, generous, and balanced in judgment. Those are all behaviors. But to Jesus, it is more than the way we act. Jesus said I am gentle and humble in heart. Friends, how is your heart? 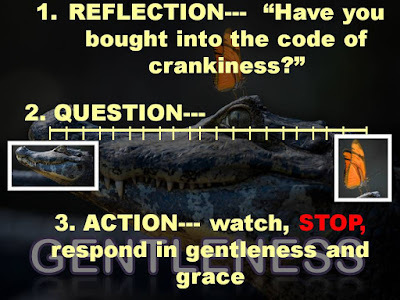 When life gets stressful, do you lash out with the hard heart of the “Code of Crankiness?” Or do you respond with the soft heart of Christ, in gentle grace and forgiveness? Like all the rest of these spiritual attributes we all the Fruit of the Spirit, we all probably have a ways to go. But remember, like all the other attributes, gentleness is a fruit of the spirit. That means it is not all up to us. Gentleness is the fruit that grows in us by the power and work of the Holy Spirit in our hearts and lives. We are not alone in as we try to grow into gentleness. There are, however, some concrete things we can do to be gentler. Jesus was very good at giving us concrete guidelines and that is why I chose the passage from the Sermon on the Mount that Dian read for us this morning. It comes from the same chapter as the beatitudes. It is on page 5 of our New Testament, if you would turn there. I want to point out three things I see in this passage. All three of these examples have to do with the way the Roman imperial army treated Jewish citizens. Physical injury, taking what wasn’t theirs, and forcing someone to carry their gear were all common occurrences. Disturbingly enough, times have not changed much. We all experience those emotional slaps in the face, being disrespected, and people are way too anxious to take advantage of others. How do you respond? Be honest with yourself. Jesus’ key to responding to these offenses comes in verse 39 which could be translated, “Do not use violence to resist evildoers.” It is human to want revenge and to react in revenge when someone hurts us in any way. But that is not Jesus’ way. That is not the way of gentleness. No eye for an eye. No slap for a slap. No rude gesture for rude gesture. No foul name for a foul name. No violence for violence. Just gentle answers. Look at verse 42 Give to everyone who begs from you, and do not refuse anyone who wants to borrow from you. Again Jesus is not asking us to be naive or gullible. He is asking us to treat others with grace. When we see someone in need, instead of turning the other way, stoop down and give them some gentle kindness. Perhaps it is material like a little money, or a coat, or food. Maybe it is not material, like a smile, a kind word, a firm handshake, or a quick prayer. It is very popular in our not-so-gentle culture, to ignore those in need, blame them for their circumstances, or expect someone else to help them. But that is not Jesus’ way, don’t just walk by, don’t grumble, don’t blame, don’t pass the buck. . Gentleness is stooping to do what you can to ease human need or suffering. Finally, Jesus teaches GENTLE ATTITUDES, which I am going to translate as grace. 43 “You have heard that it was said, ‘You shall love your neighbor and hate your enemy.’ 44 But I say to you, Love your enemies and pray for those who persecute you, 45 so that you may be children of your Father in heaven; …For if you love those who love you, what reward do you have? Do not even the tax collectors do the same? 47 And if you greet only your brothers and sisters, what more are you doing than others? Do not even the Gentiles do the same? It is easy to love our neighbor and family. It is much harder to love the enemy. It is even harder to pray for those who persecute you. Jesus is saying when we seek revenge our hearts get hard. When we respond in grace, whether that means forgiveness, acceptance, or hospitality; our hearts soften. Gentleness is offering a hand of forgiveness to those who are hard of heart. Gentleness is treating those who hurt us with the same kind of love and forgiveness God offers us. It is offering them the same kind of respect and grace that God offers us. 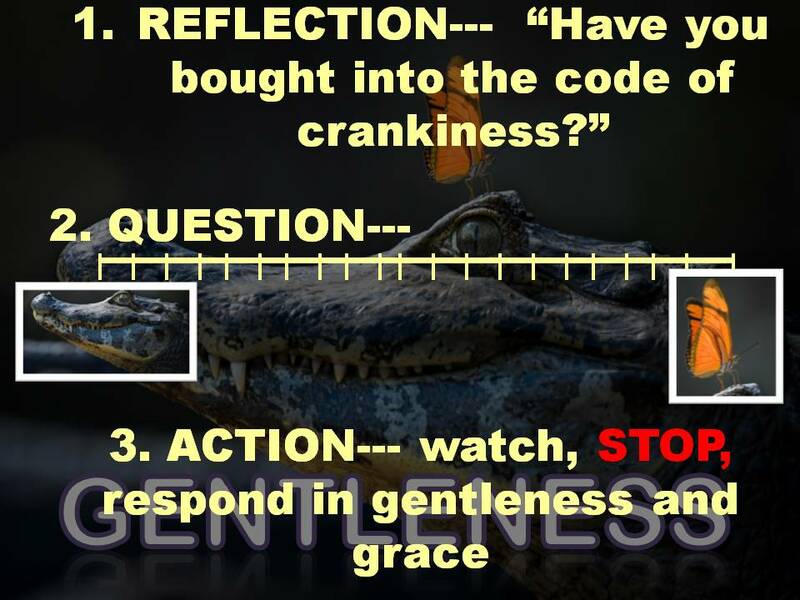 • QUESTION--- Ask someone who will tell you the truth, to rate you on the alligator/butterfly scale of gentleness. Ask several people if you are feeling pretty brave. • Finally…an ACTION--- watch for a time this week when you are tempted to react in revenge or harshness. STOP. Figure out how to respond with gentleness and grace and do it. You could do the same with each of the attributes we have discussed. And remember our spiritual lives are not a sprint, but a marathon. So I’ll end with Paul’s words.